Sustainability is the watchword in these parts. The river and lakes producers are attuned to the ebb and flow of time and water. Amongst other things, they have mastered that flow in the name of the truly unsung heroes of the table. Yes, we’re talking the essential basics here, onions and potatoes, carrots and capsicums and leafy greens, dozens of varieties of fruit and vegetables grown to sustain hungry consumers at home and in restaurants across the nation. Ok, maybe they’re not top of the pops with the soothsayers of dining trends currently obsessed with fennel pollen and kale crisps, but these beauties are damn delicious – and rather difficult to do without. Consider life without the humble and versatile spud. What would happen if your table was an onion-free zone? You cannot be serious! So in this dry and ancient land (rightly) obsessed by water, the Murray River, Lakes and Coorong are South Australia’s poster children for quiet achievement. They nourish and nurture us South Aussies, day in and day out. Officially, this region stretches from just outside Adelaide all the way to the mouth of the Murray and the Coorong coastline, and so does that local commitment to sustainability. In the historic river port town of Mannum, you can tie up your luxury houseboat (or your tinny) and step ashore to taste the landed side of river life with a meal at Café Mannum at the Mannum Motel. Fully licensed, this café serves up river views in real time from the café windows and also captured in photography in the Café’s art gallery inside. If onions and lettuce are table staples, then so are olives, and the Café’s Murraylands Plate celebrates the many varieties grown by Marne River, serving them with Marne River olive oil, dukkah, balsamic, and crusty breads baked in Mannum by Lovell’s or by McCue’s in Murray Bridge. Another revelation is the salty pop of properly fresh local pistachio nuts, enhanced with basil in the crust of an oven-baked barramundi, served with a mango, coriander and chilli salsa and fresh lime. Or try a pizza, generously topped with locally grown goodies, including those essential, oh so sweet, onions from down the road. All rivers find their way eventually to the sea, and just along from the shifting sands of the mouth of the Murray is a 90km stretch of sand, saltwater lagoons and wetlands known as the Coorong. Here, the delicate and dynamic balance of salt and fresh water sustains spectacular populations of wildlife and, happily, also nurtures some very special harvests for the hungry traveller. If you are lucky, somewhere in your travels you will learn about two really delicious local secrets: Coorong mullet and cockles. Eat them both, every – and any – chance you get, because they are hard to find away from their local habitat. That these delicacies are now available for retail at all is testament to the local fisherfolk’s hard work to achieve Marine Stewardship Council certification as a sustainable fishery, one of only a handful worldwide. If you’ve ever had mullet before, park any idea the Coorong version will be similar. Coorong mullet is not the mullet you think you know. Its flavour is certainly distinctive, but delicate and sweet too. The fishermen say it tastes that way because of the unusually high salt levels in the Coorong waterways. As for the cockles, well if you’ve ever seen anyone collecting fresh cockles, wriggling around as they dig their toes through the sand at low tide, you’re unlikely to ever forget it. Cockles have broken through from fishing family secret to fine dining favourite in the last few years; eating them locally gives you a whole new take on what the chefs have been fussing about. Lucky for us, Coorong mullet and cockles are both favourites on the menu at the Meningie Hotel, where they also have a bit of a thing for native spices (and live music too). The hotel’s restaurant, Wild Spice, ups the local factor even further with a special menu dedicated to Coorong mullet, offering options ranging from battered to grilled, to ceviche. Or maybe you’d prefer it crusted with the house-made dukkah, featuring macadamia nuts and native spices combined with the local olive oil from Jury Rd? But it’s hard to go past the restaurant’s signature dish of Coorong mullet smoked over wild rushes and seasoned with native river mint and lemon myrtle, accompanied by sweet potato chips and house-made aioli. As for the Southern Ocean cockles, they are gently tossed through a white wine and cream reduction sauce and simply seasoned with saltbush and mountain pepperleaf sourced from Outback Pride. You’ll find a list of the restaurant’s partners in culinary creation on the menu by the way, including Lakeside Meats and Feast Fine Foods, for example. Rather a nice touch, we think and very Eat Local SA. Is it Saturday yet? 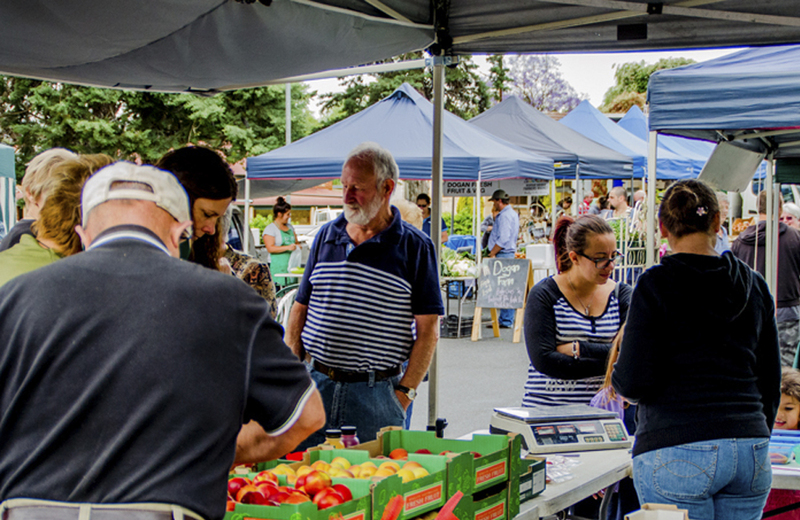 If it is, the Murray Bridge Farmers’ Market is just the place to collect a selection of your new Murray River and Coorong favourites, not to mention a nourishing breakfast. The Bremer River Café crew are on hand with their New-York inspired take on the most important meal of the day, along with a range of pickles, jams and sauces made with produce sourced from their fellow stallholders. More than a few of these recipes are previous prize winners at the Royal Adelaide Show. Did we mention there are also brownies, muffins and cheesecake to satisfy your sweet tooth? Round out the morning with a coffee roasted by the local experts at Obsession Coffee and I think we can safely predict you’ll be purring with satisfaction. This farmers’ market styles itself as your “bridge to the source”, and it’s a haven for the freshest of the Murray River and Coorong region’s in season fruit and vegetables, Growers on hand include Webbs and Dogan’s, whose produce will have been picked that very morning about five minutes away, and look for fresh and dried fruits from Weona too. Like Bremer River Café, Mother Russia also choose their ingredients from their neighbouring stallholders, bringing them back to the market transformed into preserves, ice cream, and a range of pies and sausage rolls. Six hour roast beef and mushroom pie, anyone? Now you’re talking. Mallee honey from O’Malley’s and Jury Rd olive oil are available here, and Cheese Please are on hand with superb handmade artisan cheeses, including cloth-wrapped Cheddar, Havarti and Persian feta, plus a couple of house rarities in their Belvedere, a hard Italian style cheese, and the Flinders, a mould-ripened, rinded semi-hard cheese. Cheese, and possibly some of Cheese Please’s Boatshed mettwurst and pepperoni, would partner nicely with Pao Fresco breads and baked treats for a picnic by the river after the market. There’s also a maker and craft market alongside every week, giving us all yet another good reason to drop in – after all, it’s only 45 minutes from Adelaide. Just don’t forget the onions.